I was sad to miss the annual family trek (stupid school...) to Dosewallips State Park on Washington's Hood Canal for camping and slaying of the local seafood. But fear not! 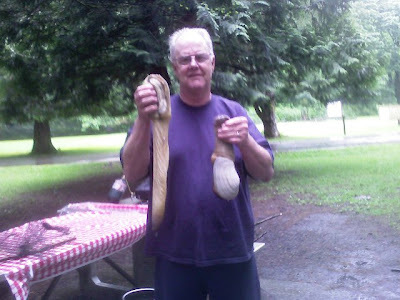 This is the year Dad mastered the harvesting of the wile geoduck (pronounced "gooey duck"). 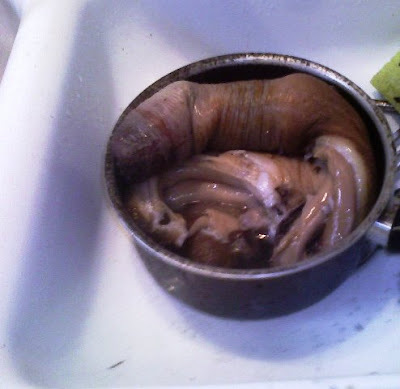 This giant clam is native to the Pacific Northwest and is the largest burrowing clam in the world. They average about 3 pounds each, but can get up to 15 pounds/6 feet in length. We have had spotty success in our hunting of this crafty beast, but a nice family from...Middleton, Idaho! was in the camp next to the parents and shared their locations and technique. Behold this magnificent meal...!